They've gone after big names before, but this time it sounds like the Knicks are walking the walk when they talk patience. This time, the Knicks are not going to do something crazy. They aren’t going to wander away from their rebuilding plan. 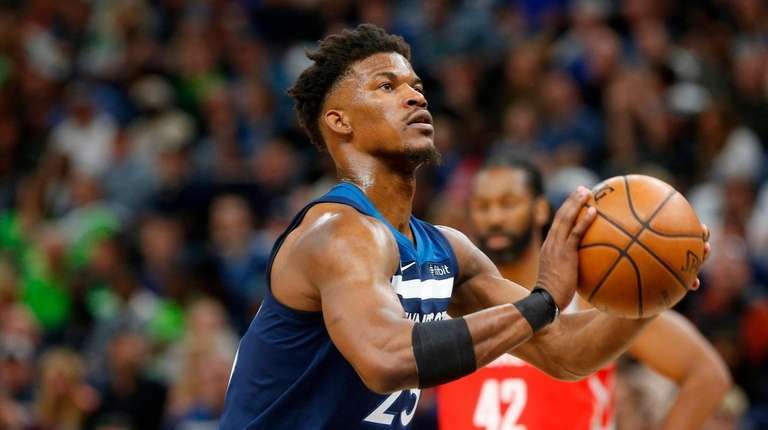 Just because Jimmy Butler wants out of Minnesota and says he is interested in the Knicks, they aren’t about to trade major assets like draft picks for a player they can get later in free agency. At least, that’s what they are saying right now. Of course, we’ve heard this all before…. And then, Carmelo Anthony wants out of Denver before the trade deadline. Or Phil Jackson falls in love with Joakim Noah after he shows up at his house in Montana. Or Isaiah Thomas decides that it would be a great idea to trade a bunch of players and three draft picks, including what ended up the No. 3 overall pick in 2006, for Eddy Curry, a player who has been hospitalized for a heart ailment. As the Knicks prepare to open up the season with a new coach in David Fizdale and year-old management team of Scott Perry and Steve Mills, they are insisting that they are going to try to grow this thing organically, that they are going to show some rare restraint. “We’re committed to not missing any steps. It’s a step-by-step process,” Mills said yesterday “We’re focused on guys we have on this roster, how we can build them, develop them and continue on from that point. In other words, the Knicks are unwilling right now to part with draft picks or top prospects to acquire a player, so a blockbuster deal for Butler isn’t likely to happen. The focus, until further notice, is developing players like Kevin Knox, Frank Ntilikina and Mitchell Robinson, not flipping them. “We’ve had so many talks about the process that we want to take, and the plan that we set forth, how we want to build it from the ground-up culturally,” Fizdale said. “We don’t want to jump at the shiny things. We want to make solid decisions and be patient with this process and I’m a big part of that patience. Mills said that the management team also has the full support of James Dolan to build this team in a slow, patient manner. Of course, sticking with the young guys sounds pretty good right now. But this is a team that will be playing until at least February and maybe longer without Kristaps Porzingis. As much as Knicks fans in theory might want them to do poorly to put themselves in a good lottery position, the reality of supporting what could very well be a 12-win team at the All-Star break is not going to be pretty. But then, neither is the reality of cheering for a team that has missed the playoffs five straight seasons and has only gotten beyond the first round once this millennium. The Knicks can wait until the offseason.